Lovecraft with loli. Oh Japan, is there anything you won’t turn into a little girl? This is a hell of a thing to watch. It’s definitely an interesting concept (despite the fact that it’s going to end up as an action harem series) and it’s surprisingly fun. After nearly being killed by a horrible demon, Mahiro Yasaka is saved by Nyarlathotep, who I only know of because he keeps starting crap in the Persona universe. Oh, and he’s apparently a little white-haired girl with a hell of an ahoge going on and takes the name Nyaruko. And is an alien, just like everything else from the Cthulhu Mythos, because why not. The animation quality is pretty good and the voices and stuff were nice. Opening was damn catchy (if not entirely my thing) and the ending was suitably soft. As far as looks and sounds go, I’ve only got one real problem. Nyaruko’s facial expressions look weird half the time. I’m not sure if it’s just a first few episodes problem (since I’ve only checked out the first of three that are out), but it bugs me. I have to say a lot of the stuff is pretty amusing or just really well done, such as the fast-forwarded explanation and all of the spectacularly gory fights. But, well, a lot isn’t all. I’ve got some big problems with the series, outside of the Crawling Chaos’s sometimes-wonky face. First, Nyaruko’s ‘I am the chaos that crawls up with a smile to greet you’ speech is annoying after the first few times. The third time this episode in the bath scene seemed unnecessary. My second huge problem (really my biggest problem) with this is that, for some strange and unexplained reason, they made the Cthulhu Mythos demons and gods into aliens! Like… come on, guys, you had a cool thing going for you, but you screw it up by going ‘lol aliens’ on us?! Unless the specification of space becomes a plot point, I’m going to go out of my way to ignore that. So yeah, it’s not the best series in the world and it kind of bothers me, but it’s fun and pretty amusing. Now if you fine folks will excuse me, Thaumcraft (well, all of the Technic Pack, really) has had me addicted for about a week now so I’m going to go put zombie brains in a jar. As always, thanks for reading and have a good’un. 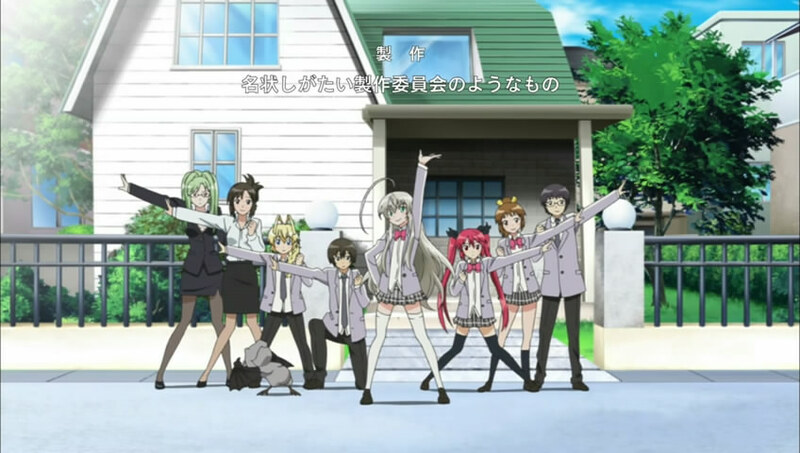 This entry was posted in Anime and Manga, First Impressions and tagged haiyore nyaruko-san episode 1, haiyore nyaruko-san first impressions, nyarlathotep anime, nyaruko-san first impressions. Bookmark the permalink. Only read one of his shorter ones (the name of which completely escapes me, sadly), but I appreciate his work. Didn’t rage until the alien nonsense hit, myself.